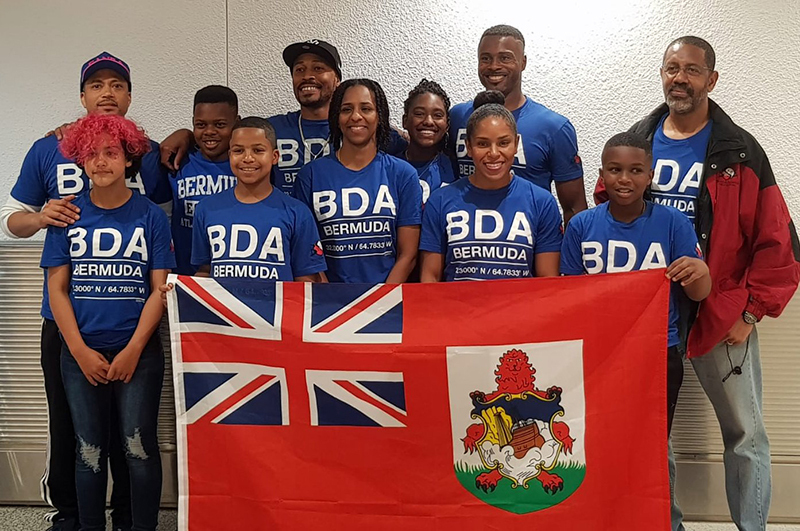 The Bermuda Sanshou Association team made an excellent showing at the 20th Bridgetown Burning Martial Arts Festival in Barbados this weekend, winning a total of 11 medals – 8 gold, 2 silver and one bronze medal. Nathaniel Thomas defended his 9 years and under title in a division with eight competitors, Matai Phipps also secured a gold medal in a round robin in the 11&12 year age group, while teammate Shaela Bailey secured a bronze medal amongst the boys in the same division. 12 year olds Dominique Brown and Szaine Williams both claimed gold medals in their respective divisions against older teenage opponents. Ryley Mason celebrated her 18th birthday by defeating Chevreuil Johana of Martinique in a 3 round kickboxing match to claim the gold medal in the women’s 60kg kickboxing division. Krista Dyer faced last minute replacement Sarah Carswell of the USA in the 159lb division in a extremely tightly contested match that was extended to 4 rounds after the initial 3 rounds were dead even. Carswell, the naturally heavier fighter, used her reach advantage to land some front kicks to the body to take the decisive round, and Dyer earned the silver medal. Quennel Robinson went down to San Da 80kg repeat champion from Barbados, Ronaldo Stuart. Robinson used his wrestling skills to take down Robinson and win the match 2 rounds to 0. Talia Iris added three gold medals to Bermuda’s tally by delivering flawless, high-scoring forms in open hand kata, open hand weapons and tai chi weapons. The majority of the team will also take part in beach wrestling at Longbeach Burning on Sunday. Members of the contingent will also perform in the various martial arts demonstrations during the event. Congratulations. Fantastic and successful group! !